Split into six sections, construction underway in 2018 along Western Loop includes the upgrade of the interchange joining U.S. 421 and Peach Haven Road, redesign of the interchange at U.S. 52 and N.C. 65, and initial work at the exchange joining the Winston-Salem Northern Beltway with U.S. 52. Start dates for construction on the Western Loop mainline between I-40 near Clemmons and U.S. 52 at Rural Hall ranges from 2021 to 2027. A directional-cloverleaf interchange will be constructed in place of the wye interchange (Exit 117) with the SR 1840 connector to N.C. 66. 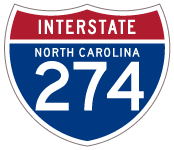 Interstate 74 will branch east from U.S. 52 along the Winston-Salem Northern Beltway from I-274 and U.S. 52 over SR 1840. I-274 will connect with Interstate 40 at a three quarter cloverleaf interchange just east of Winston-Salem city line at Clemmons. The Winston-Salem Northern Beltway will extend east from that exchange to at an at-grade intersection with U.S. 158 near Jonesboro Road and SR 1120 (Clemmonsville Road). Droz, Robert V “AASHTO SCOH Report.” Online posting. May 30, 2003. news misc.transport.road. I-74 Segment 4, NC’s Future Interstates (Robert Malme). “Buckle up: Winston-Salem’s Northern Beltway work picking up speed” Winston-Salem Journal (NC), May 25, 2015.